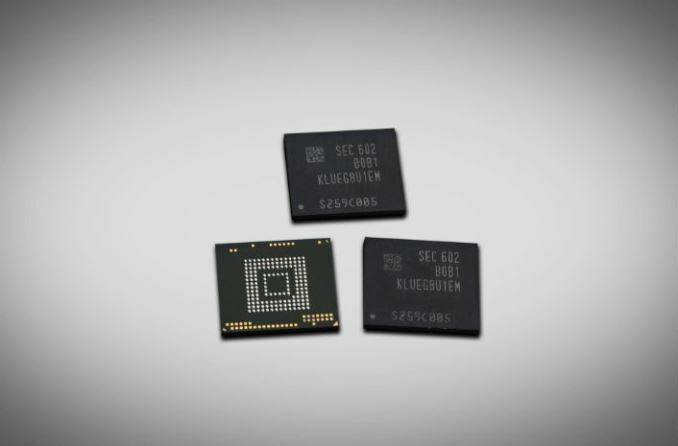 Interestingly enough, we’re seeing something of a division in the mobile storage space, as it seems that some OEMs are focusing their efforts on UFS for internal storage, while others are moving towards NVMe over mobile PCI-E. Samsung Electronics seems to be staying with UFS for now, and recently announced their next generation of UFS 2.0 embedded storage solutions, which use 3D V-NAND to enable better NAND storage characteristics and to bump up the capacity from 128GB to 256GB. By moving to V-NAND, random reads and writes are now at 45k and 40k IOPS, or 176 and 156 MB/s with 4KB blocks, which is well over double what shipped in the Galaxy S6. For sequential reads, speeds top out as high as 850 MB/s which is even faster than the 520 MB/s maximum of some SATA SSDs. Given that this is likely to be Samsung’s 30nm V-NAND process, I suspect that the storage density needed to achieve this kind of performance involves some sort of SLC/TLC hybrid, but in the absence of more information it’s hard to say. While the new NAND definitely is part of the speed improvement, it couldn't have been achieved without an increase of the interface bandwidth. The new memory today is the first announced UFS 2.0 solution based on a 2-lane interface. The UFS 2.0 standard defines a lane running at up to HS Gear 3 at up to 600MB/s, so doubling up of the lanes gives a theoretical maximum of 1.2GB/s. It’ll definitely be interesting to see what devices adopt this storage solution in the near future. So mobile phones will have a faster interface than 90% of desktop SSD's. Cool. Much of it would be to do with cable lengths, I'd imagine. SATA needs practical cable lengths, which adds latency and all sorts of noise, while embedded devices require only PCB traces and will have a much cleaner signal. It wouldn't be too hard to set cable length limitations for a supposed SATA1200. I understand that it wouldn't be perfect in any way but I guess that it would be pretty easy to implement. Especially considering so many years have passed since SATA600. A 30cm cable would be more than enough for most I guess. M.2 SSD's are maybe okay for boot drives but soon 1TB TLC SSD's are going be dirt cheap. A PCI-E boot drive and a 1TB or 2TB data SSD would be nice to have. For a data drive, random performance doesn't matter much. Also M.2 SSD's are a pain to access once the computer is built. Often blocked by your video card. SATA Express is dead because it's limited to two lanes, whereas all current and upcoming PCIe/NVMe controller designs are four lane. Simply put, SATAe doesn't offer enough bandwidth. Understand that there will never be a SATA1200. The SATA group decided years ago to stop developping their own standard and use PCIe instead. There are multiple reasons for that, but the big one was that increasing speed over 6Gb was non trivial. PCIe itself went 2.5Gb, 5Gb then 8Gb (with better encoding ). The next gen storage was supposed to be SATAexpress, based on x2 lanes of PCIe gen2, but they messed up, including an undefined connector and by the time they got a full standard, including mechanical and all, the specs were too slow (pcie gen2 x2 is ~1Gb), while professionals went for hhhl cards with pcie gen3 x4. M.2 was designed with the same standard and now U.2 exists, which allows, with one plug, to use SATA 6Gb, SAS12Gb and pcie g3 x4. This is already used today in enterprise (for 2.5" pcie ssd). SATA/AHCI were built with spinning disks in mind. Definitely not the best way to go for solid state memory. That is what NVMe is trying to solve. It's not about the physical interface as much as the logic behind it.